Observation - Frilly-edged foliose lichen - UK and Ireland. 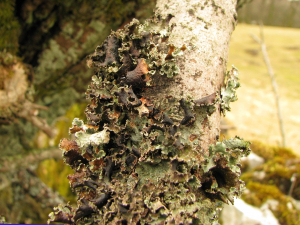 Description: Light green foliose lichen with frilly lobe edges growing on deciduous tree branch. Soredia/isidia along lines on lobe surfaces and along lobe edges. Underside black but light brown towards edges of some lobes. Possibly Platismatia glauca. Light green foliose lichen with frilly lobe edges growing on deciduous tree branch. Soredia/isidia along lines on lobe surfaces and along lobe edges. Underside black but light brown towards edges of some lobes. Possibly Platismatia glauca.